Commentary, Deleted Scenes, Storyboard Comparison+More! 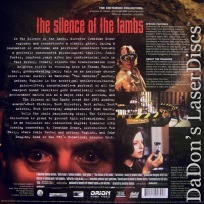 The Silence of the Lambs 1991 - 118 min. - Color Genre: Thriller Rated R Country: USA LaserDisc Movie Storyline: Jodie Foster and Anthony Hopkins will likely be forever associated with their roles in this bone-chilling masterpiece, based on the novel by Thomas Harris and directed by Jonathan Demme. FBI trainee Clarice Starling (Foster) is sent by her supervisor (Scott Glenn) to interview ferociously intelligent serial killer Hannibal "The Cannibal" Lechter (Hopkins) at his cell in a Maryland mental hospital. The FBI hopes Lechter can provide insight into the mind of killer-at-large, Buffalo Bill (Ted Levine), whose current abductee happens to be the daughter of a senator. Intrigued by Clairice, Lechter demands information about her personal life and in exchange for clues, and the two begin to form a strangely intimate connection, with a girl's life hanging in the balance. Starling is gradually revealed as a woman struggling out of her own darkness, bound to aid the dysfunctional males around her on their own paths of transformation, liberation, and destruction. This is a film of brilliant and disturbing beauty that transcends its B-movie origins (though it does honor them with a cameo appearance by Roger Corman). Its enduring influence has led to a slew of similarly dark-toned serial killer films, and a sequel, HANNIBAL (2001). LaserDisc Movie Review: In this multiple Oscar-winning thriller, Jodie Foster stars as Clarice Starling, a top student at the FBI's training academy whose shrewd analyses of serial killers lands her a special assignment: the FBI is investigating a vicious murderer nicknamed Buffalo Bill, who kills young women and then removes the skin from their bodies. Jack Crawford (Scott Glenn) wants Clarice to interview Dr. Hannibal Lecter (Anthony Hopkins), a brilliant psychiatrist who is also a violent psychopath, serving life behind bars for various acts of murder and cannibalism. Crawford believes that Lecter may have insight into this case and that Starling, as an attractive young woman, may be just the bait to draw him out. Lecter does indeed know something of Buffalo Bill, but his information comes with a price: in exchange for telling what he knows, he wants to be housed in a more comfortable facility. More important, he wants to speak with Clarice about her past. He skillfully digs into her psyche, forcing her to reveal her innermost traumas and putting her in a position of vulnerability when she can least afford to be weak. The film mingles the horrors of criminal acts with the psychological horrors of Lecter's slow-motion interrogation of Clarice and of her memories that emerge from it. 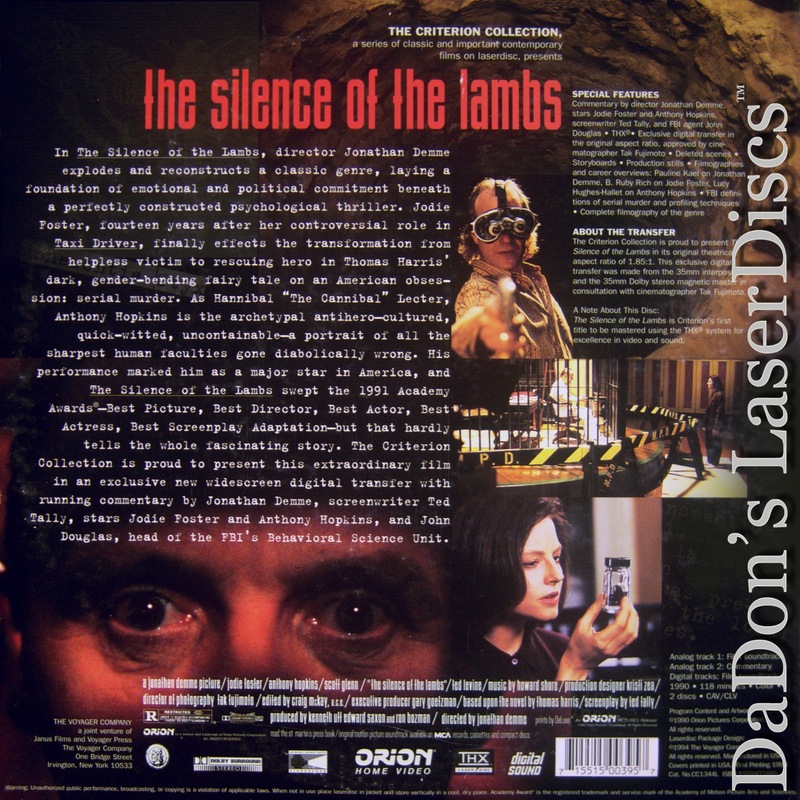 --- Mark Deming The only horror film to win a Best Picture Oscar, The Silence of the Lambs was released early in the year by a company (Orion) that went bankrupt and could not afford a significant award campaign for the film. For these reasons, it is among the least typical of Oscar-winning Best Pictures, a distinctive incidence of good filmmaking winning out over movies with more studio promotion behind them. It succeeds almost entirely due to the performance of Anthony Hopkins as cannibal serial killer Hannibal Lecter. Indeed, both co-star Jodie Foster and director Jonathan Demme took home Oscars largely for having had the good sense to allow Hopkins to dominate the film. Hopkins' Best Actor award notwithstanding, Lecter is only a supporting character, onscreen for less than a third of the film. The central story, about the search by a young FBI agent (Foster) for a different serial killer, Buffalo Bill (Ted Levine), is considerably less interesting, though Foster does an admirable job of bringing credibility to a convincing showdown sequence. --- Richard Gilliam Thanks for Visiting DaDon's Rare LaserDiscs ! Reviews, Articles, Newsletter and Information for Movies on LaserDisc LD Laser Disc, LazerDisc.